The Hirpini were a group of Italics who, during the Iron Age, were located on the eastern edges of the modern region of Campania. They were neighboured to the north by the Caudini clan of the Samnite confederation, to the east by the Iapyges, to the south by the Lucani and Oenotri, and to the west by the Etruscans who dominated the land around Capua. The Oscan-Umbrian group of which the Hirpini were part are largely accepted as being Indo-Europeans (perhaps proto-Celts) who migrated into the peninsula from the north. For a sizable part of their existence as an identifiable clan, they formed part of the Samnite confederation. This was a loosely-knit grouping of four clans: the Carracini, Caudini, Hirpini, and Pentri (the most important of the clans). The Frentani may also have joined them as they expanded their territory. Although not mentioned by history until the third century BC, it is clear that the Hirpini had existed as a recognisable clan for some centuries beforehand. They were settled in communities in the southern part of Samnite territory, in a high region of the Apennines that still bears their name today, Irpinia. The modern region of Basilicata lay immediately to the south and Apulia lay to the east. Their language came from the Oscan-Umbrian group of Indo-European languages (P-Italic), which were widely spoken in Iron Age central and southern Italy before the rise to dominance of Latin (Latin itself was a slightly more distantly related language, coming from the Indo-European Latino-Faliscan group, or Q-Italic). The Hirpini were the 'uomini-lupo' or 'wolf-men'. In effect, their name comes from the Oscan word 'hirpus' (which properly means 'wolf') because it was believed that they had arrived in their lands after a 'Holy Spring', having a wolf as an animal guide. They were not the only Italic people to have an animal totem, as the Picentes were claimed to have a similar animalistic name for their people. The Samnite confederation of clans would already appear to exist and has settled along the Apennine range. According to Thucydides, the arrival of the more warlike Oenotri and Opici in northern Calabria triggers the migration of the Elymi, Itali, and Siculi into the 'toe' of Italy and onto Sicily. Antiochus of Syracuse, writing around 420 BC, confirms this. The migration would seem to be the trigger for the Lucani to enter the modern regions of southern Campania and Basilicata, thereby separating themselves from the main Samnite body. The tough Pentri tribe occupy the central Samnite region, with the Carricini in the northern region, and the Caudini to the south of the Pentri. The Hirpini occupy the far south of 'Samnium', between the valleys of the Ofanto, Calore and Sabbato rivers. Their main cities are Abellinum, Aeclanum, Compsa, Maleventum (later called Beneventum by the Romans, and Benevento by the Lombards), and Trevicum. Hamilcar of Carthage lands a huge army in Sicily in order to confront Syracuse on the island's eastern coast. The Carthaginians are defeated by the Greeks at the Battle of Himera, and a long struggle ensues with intermittent warfare between Carthage and Syracuse. The defeat results in substantial political changes in Carthage, and it also results in the loss of the Etruscan cities of Campania in the south during the course of this century, to Rome and the Samnites. The Samnites expand south-westwards into the rich plains of Etruscan Campania, capturing the towns of Capua in 438 BC and Cumae (modern Cuma) in 421 BC. Given the location of the Caudini and Hirpini in Samnite territory, they are probably at the forefront of this push towards the Tyrrhenian coast. Rome triggers the First Samnite War after the Samnites refuse to stop threatening Greek coastal colonies. Roman Consul Cornelius attacks the Samnite town of Saticula (on the border of the modern region of Campania), but the war ends with Rome distracted by the Latin Wars against its other Italic allies. With the Samnites continuing to pressure the Greek colonies, the Second Samnite War is triggered against Rome. The Samnite commander, Gaius Pontius, leads a force of around 9,000, including a thousand cavalry, with which he wins several early victories. He defeats the army of Roman Dictator Lucius Cornelius Lentulus, and captures the towns of Canusium and Gnaitha, but the Samnites suffer defeat at the hands of Quintus Fabius Maximus Rullianus at Imbrinium. 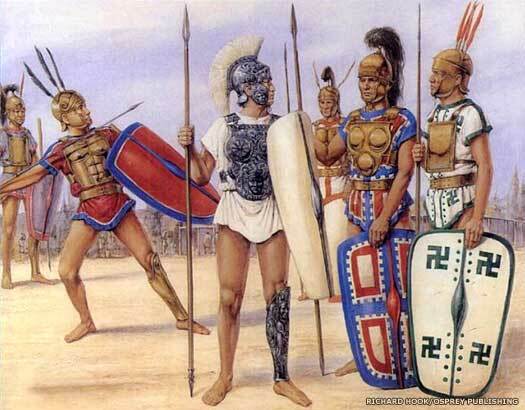 The Samnites are seeking allies in advance of a renewal of hostilities against Rome. The Third Samnite War begins with Consul Quintus Fabius Maximus Rullianus immediately defeating the Samnites at Tifernum after managing to encircle their forces. Rome establishes a colony at Maleventum (or Beneventum as the colonists call it, the later Benevento). This act robs the Hirpini of one of their main cities and points to their subjugation by the Romans. The colony itself is probably the key to holding down the Hirpini. The Second Punic War is fought by Rome against Carthage. Rome is aided by its Etruscan, Frentani, Picene, and Umbrian forces, but Italy is invaded by Hannibal Barca and a Roman army is massacred at the Battle of Cannae in 216 BC, killing 60,000. It is at this stage that the Hirpini (now acting independently from the Samnite collective) declare for the Carthaginians. Beneventum remains in Roman hands, and in the following year Rome also recaptures three smaller Hirpini towns thanks to the efforts of Praetor M Valerius. In 214 BC, Hirpini territory is used by Carthaginian General Hanno against Tiberius Gracchus, and in 212 BC Hanno attempts to recapture former Samnite town of Capua. When the Carthaginians finally withdraw in 209 BC, the Hirpini submit and gain beneficial terms by betraying the Carthaginian garrisons which still occupy their towns. Rome establishes full dominion over the south-east of Italy and the tribes of the Dauni, Hirpini, Iapyges, Lucani, Messapii, and Peucetii. 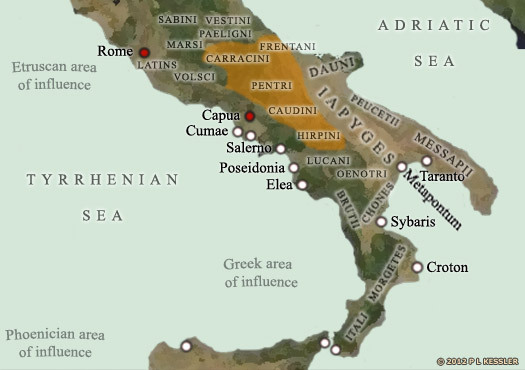 A colony of Ligurians is transplanted from the north by Rome and resettled in the Tamarus valley, to the north of Beneventum. Known as the Ligures Barniani et Corneliani, their colony is still recognisably distinct during the lifetime of Pliny in the first century AD. Along with the Etruscans, Lucani, Marrucini, Marsi, Paeligni, Picentes, and Vestini, the Samnites fight the Social War (Italian War, or Marsic War) against Rome. The war is the result of increasing inequality in Roman land ownership, and the spark for conflict is delivered by the assassination of the reforming Marcus Livius Drusus, whose efforts would have led to citizenship for all of Rome's allies. Along with the Samnites in general, the Hirpini are amongst the first to take up arms, but in 89 BC Sulla takes Aeclanum, one of their strongest cities. The Hirpini are greatly shaken by this, and they and their allies submit to Rome. Although defeated, the Italic tribes are granted the Roman citizenship which had previously been withheld from them. Samnite leader during the Social War. Probable first commander of the Hirpini. Probable second commander of the Hirpini. Roman Dictator Lucius Cornelius Sulla conducts an ethnic cleansing campaign against the general population of Samnites, but this appears not to include the Hirpini, some of whom had clearly been favourable towards Rome even during the Social War. However, they do lose sizable portions of their better territory, possibly to wealthy Romans. They, and their Samnite cousins, are quickly absorbed into Roman Italy and disappear as a recognisably distinct people.